As one might expect, DKIII has shown us a lot of the same imagery The Dark Knight Returns did. Armored Batman, Batman being hunted, Batman against Kryptonians, etc. DKIII #6 gives us yet another one: The death of Bruce Wayne, complete with a heart monitor on the page. It’s just a shame he goes down in perhaps the most anticlimactic way possible. I’m calling BS on Bruce Wayne being dead. Or if he is dead, he’s coming back by the end of the story. There’s no way Frank Miller’s Batman, even if he’s mostly written by Brian Azzarello at this point, goes out via a quick heat vision burst (shown below). 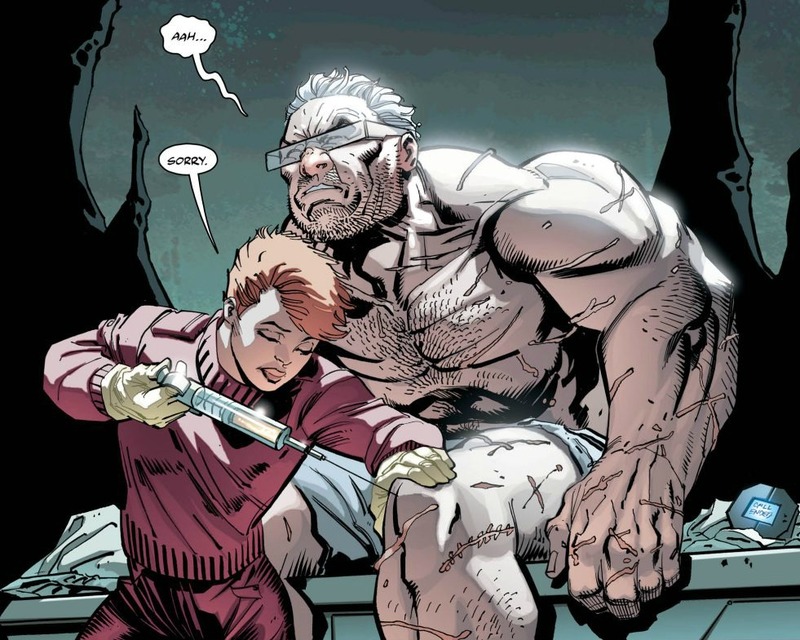 They’ll stick him in a rejuvenation chamber, a Lazarus Pit, or find some other way to restore him. I’m betting this will serve the dual purpose of rejuvenating his body so he doesn’t need crutches anymore. 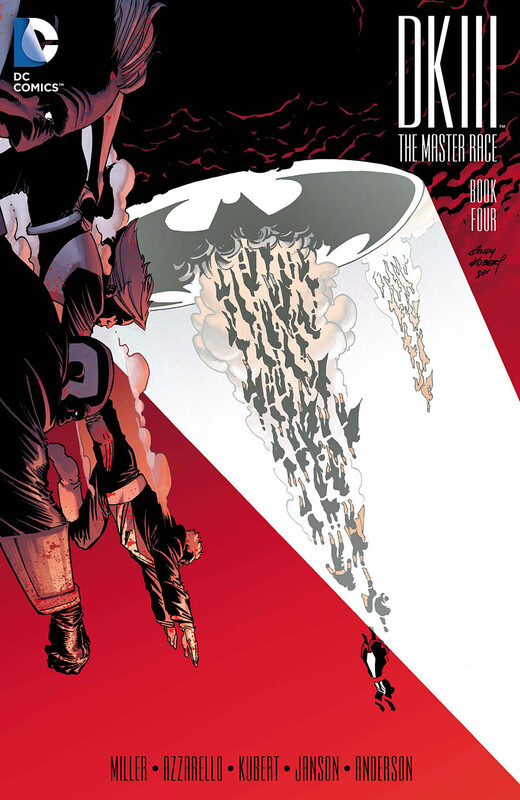 DKIII was originally advertised as the final installment in the Dark Knight series. So it’s possible they were intending to kill Bruce off here. But now I’m betting plans have changed. 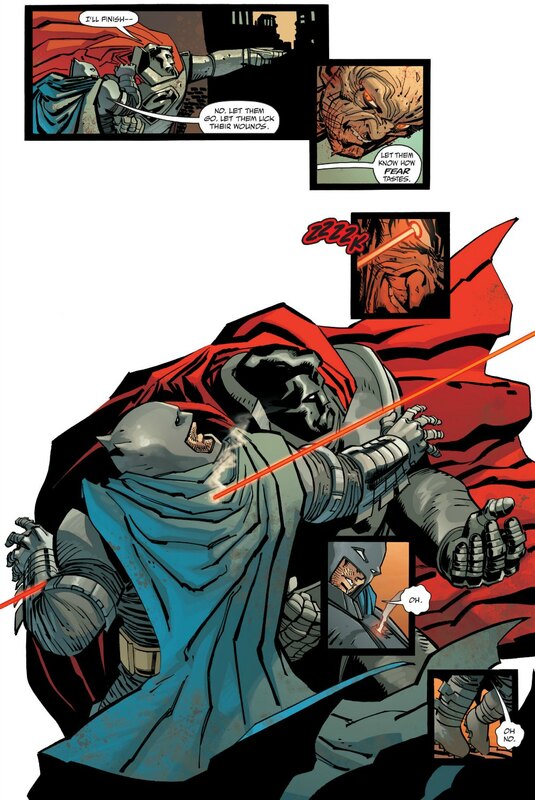 If DKIII has proven anything, it’s that there’s still great value in putting Frank Miller and Batman together. The first issue sold 449,100 copies, making it one of the best selling single issues since the turn of the century. Since then, the book has remained a top 10 seller amongst all publishers. Frank Miller may be controversial, and neither sequel has done much justice to the legacy left by The Dark Knight Returns. But when you put Miller on a Batman book, it’s newsworthy. That’s a well DC can go back to when they need a boost. Miller is apparently willing to go back, as last year he talked about being the solo writer for a Dark Knight IV story. I believe DKIV is happening. But Miller by himself? I’ll believe that when I see it. As for this issue, it’s mostly fluff until the finale. It looks pretty, and we get some decent one-liners. (“You want to shut him up, or should I?”) But when we open the issue, our heroes already have the battle mostly won. Most of the action comes from a fight between Batgirl/Carrie Kelley and Baal, Lara’s love interest, who is unaffected by the rain. 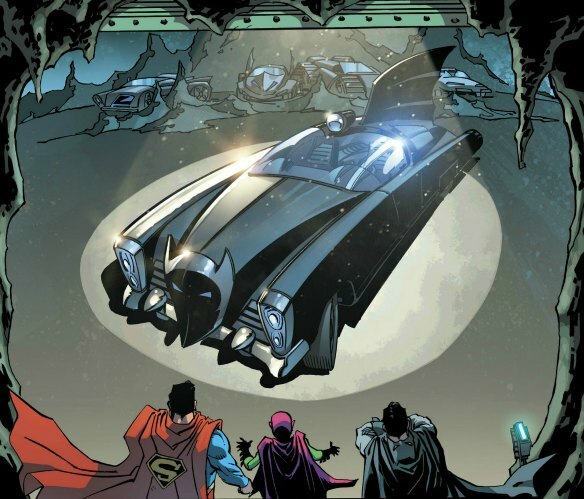 The Batmobile winds up shredded, which is a cool visual. She eventually ends up beating him with, of all things, her slingshot. Another callback from The Dark Knight Returns. By the way, can we get better costumes for DKIV? Superman’s armor doesn’t look any less stupid this time around, nor does Batgirl look less gaudy. Our mini-comic this time is Dark Knight Universe Presents: World’s Finest #1, featuring a confrontation between Lara and Batgirl. Wonder Woman eventually intervenes. I’d be interested to know why this wasn’t in the main issue, with the Baal/Carrie fight getting the backseat. There’s so much more meat here, and it’s in line with what we’ve built up to. 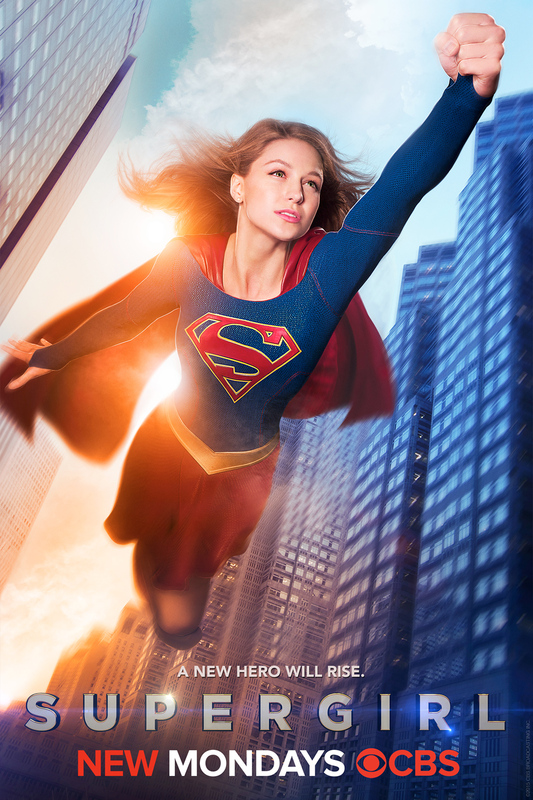 The Kryptonians have convinced Lara to turn her back on her family and humanity at large. One would think the story culminates in Batman and Carrie having to stop her, which creates tension with Superman and Wonder Woman, and all the drama you mine from that. Where we go now that Bruce has “died” is an interesting question. 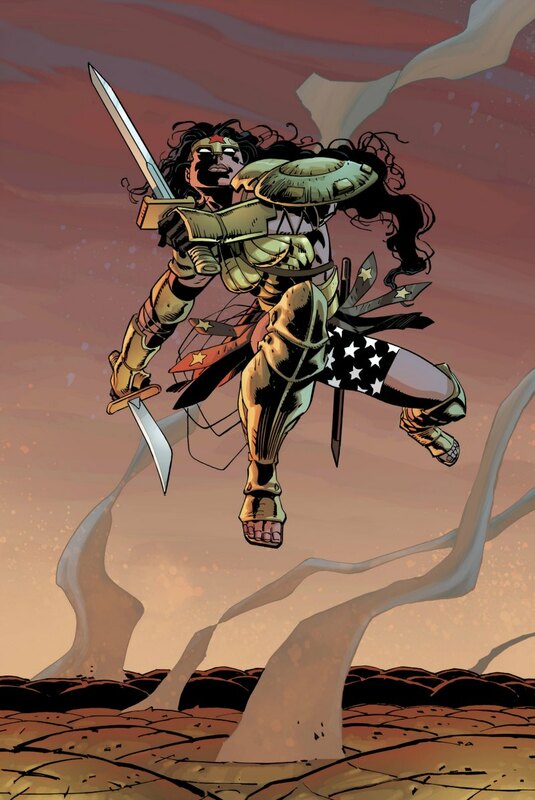 As for Frank Miller’s art…it’s Frank Miller’s art. At this point, it is what it is. Here’s what I will say: These mini-comics have always been beautifully colored by Alex Sinclair. I’m almost past the point of judging DKIII as good or bad. It’s already not my cup of tea. And yet, I keep slapping cash down for it. At $5.99 an issue, it’s not cheap either. But as DC knows all too well, comic book fans will pay to read what Frank Miller has to say about Batman. It’s been 30 years since The Dark Knight Returns and Batman: Year One, but maybe we’re all secretly hoping he has one more classic left in him. Again, I’ll believe it when I see it. 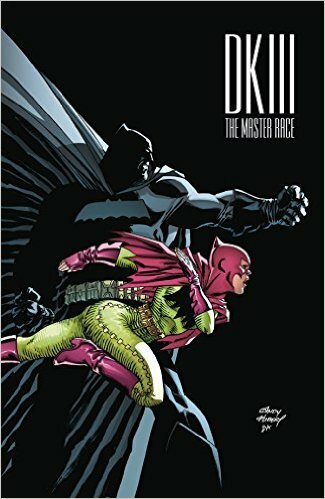 This entry was posted in Comic Books/Graphic Novels and tagged Alex Sinclair, Andy Kubert, Batgirl, Batman, Brian Azzarello, Bruce Wayne, Carrie Kelley, comic book reviews, comic books, Dark Knight III: The Master Race, Dark Knight III: The Master Race #6, Dark Knight Universe Presents: World's Finest #1, DC Comics, DKIII, Frank Miller, Frank Miller Batman, Gotham City, Krypton, Lara The Supergirl, Rob Siebert, single issue reviews, Superman, The Dark Knight Returns, Wonder Woman on 10/22/2016 by primaryignition. The Flash is kind of a big deal for DC right now. He’s got a TV show on The CW that pulls in millions of viewers per episode. What’s more, it’s actually a damn good show. Viewers of said show may want to avoid this issue. Their hero not only goes out like a chump, but he’s wearing one of the gaudiest costumes the DC Universe has ever seen. We open the issue with a showdown between father and daughter. 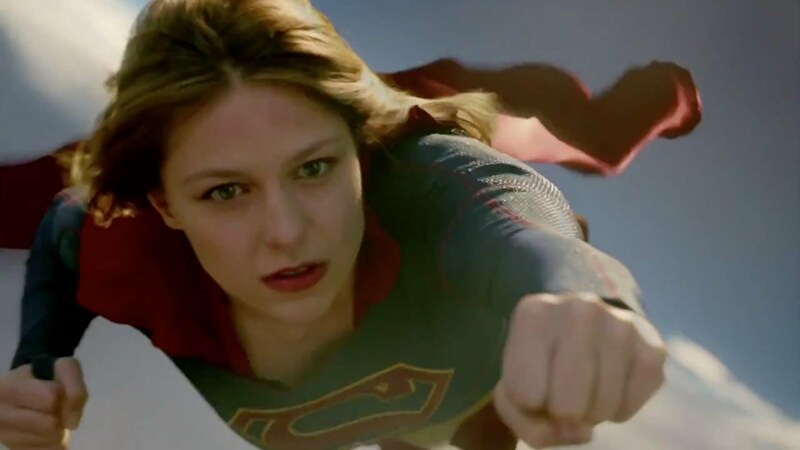 It’s Superman against Lara the Supergirl, who happens to have an army of Kryptonians behind her. Once they’re done with him, Batman is next in line. 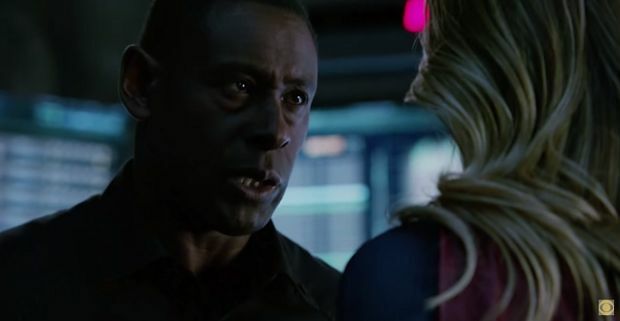 Quar, leader of the hostile Kryptonians, demands that Batman be produced or Gotham City will be destroyed. Once again, The Dark Knight is about to come out of retirement. But this time, he seemingly has no choice in the matter. 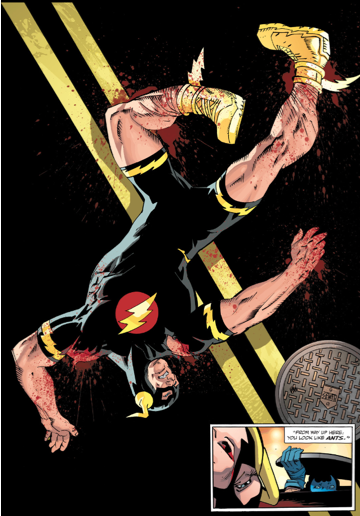 This issue devotes three pages to The Flash being taken out by a Kryptonian. I can’t say I was a fan. He doesn’t even put up a fight. He simply gets his legs taken out, and it’s all over. If you’re going to devote that much of your issue to taking out a hero, that’s fine. But come on! This is The Flash! Now more than ever, this guy is one of DC’s big guns! Give him at least a little offense! That costume is a leftover from The Dark Knight Strikes Again. That alone should have been a red flag. I understand that book can’t be completely ignored. But there are certain things from DKII that need to be left in the past. This costume is undoubtedly one of them. Surprisingly, the first thing we see when we open the issue is The Atom. Despite the CRUSH we saw in issue #2 that seemed to indicate Ray Palmer had been killed, apparently he’s alive, albeit in a microscopic state. I can’t say I’m sad to see him back. But his death was a nice punctuation mark on the arrival of the Kryptonians. It’ll certainly be interesting to see how he factors in later. Quar, Lara, and the other Kryptonians either kill or neutralize Superman, depending on how you interpret the issue. 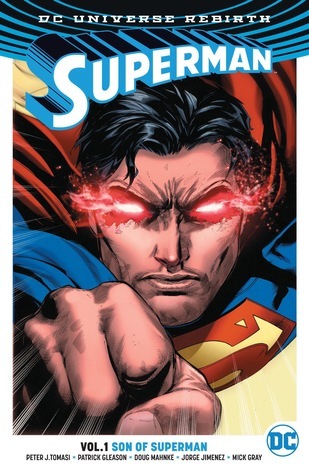 Despite all the blood he spills in this issue, there’s no way Superman is gone. Not with his daughter playing such a crucial role in things. If there was ever a time for a reconciliation between Batman and Superman, it’s now. Once again, Andy Kubert does a fine job evoking Frank Miller’s style, while still making the book his own. This is most evident in the way he draws Bruce Wayne. The detail he puts into the character’s facial expressions and his scarred physique are fantastic. It’s almost as if someone has flipped a light on, allowing us to see details we’ve never seen before. One of my few complaints with the art in this issue involves the scene where Commissioner Yindel sees Batman for the first time in the story. 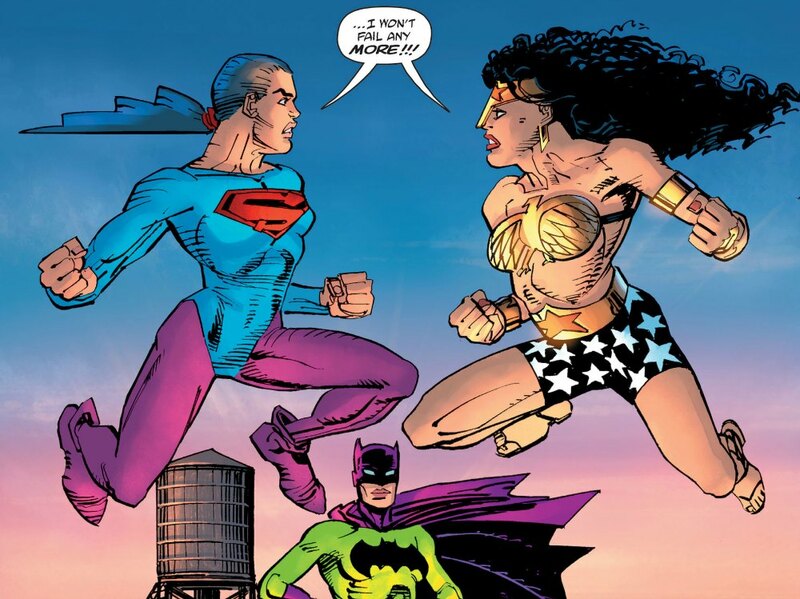 She’s been searching for him since the first issue, and now they’re finally face to face. We see Batman shrouded in darkness, holding the flask he’s just taken from a hopeless Yindel. 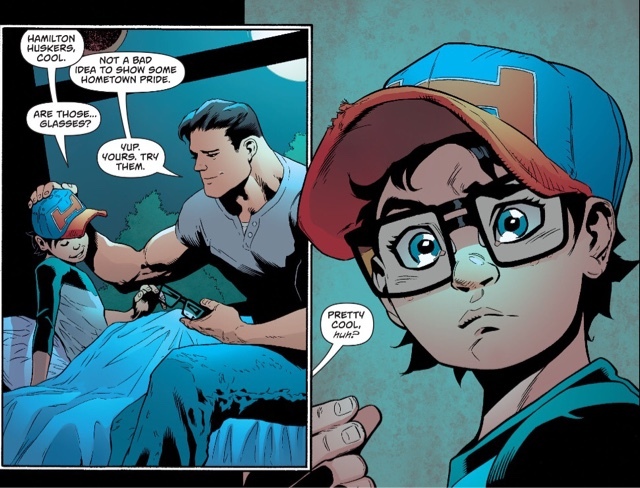 I envisioned this scene being as impactful as Superman’s return to consciousness last issue. It isn’t. I think it would be different if Kubert, inker Klaus Janson, and colorist Brad Anderson had taken him out of the darkness a bit more. This Batman doesn’t always lend himself to the whole shadowy figure of the night routine. He’s big, bulky, and brash. This would have been a big time for one of those toothy scowls he’s always flashing around. DKIII hasn’t given us much of Batman in all his grandeur yet. This would have been a good time to play that card. 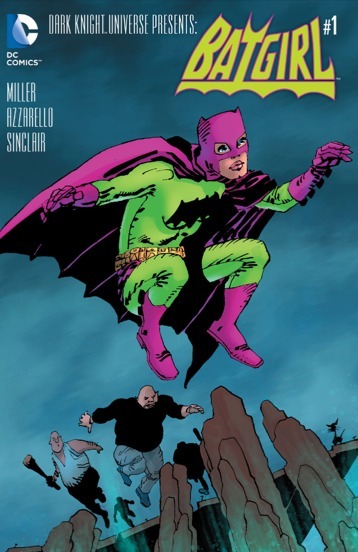 This issue’s mini-comic gives us Batgirl as we’ve never seen her before: Drawn by Frank Miller and wearing Joker colors. Seriously! What the hell is up with that costume? If Batgirl has ever looked worse, I can’t remember it. That’s not even getting into how weirdly she’s proportioned. The story mostly consists of Carrie Kelley, after being given the Batgirl costume by Batman, fighting off some thugs at a dock. Aquaman emerges from the water to save her when she gets in over her head. Why he happened to be there is anybody’s guess. Hopefully we’ll learn more next issue. But if what happened to Green Lantern and Flash is any indicator, I’m hoping he’s got good healthcare down in Atlantis. This issue is still decent in terms of the core story. But the Flash interlude and the weird acid trip that is the Batgirl issue prove to be nagging distractions. As such, this is the least satisfactory installment of DKIII thus far. 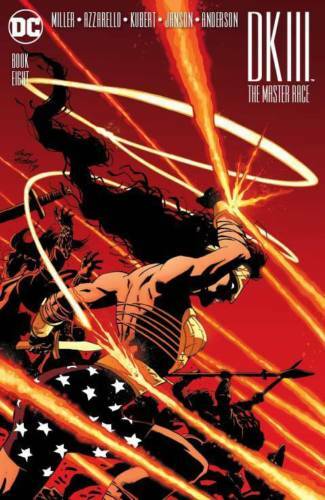 Brian Azzarello maybe in the driver’s seat, but Frank Miller’s fingerprints are still there…. Images 1 and 3 from weirdsciencedccomicsblog.blogspot.com. Image 2 from newsarama.com. This entry was posted in Comic Books/Graphic Novels and tagged Aquaman, Batgirl, Batman, Brian Azzarello, Carrie Kelley, comic book reviews, Commissioner Ellen Yindel, Dark Knight III: The Master Race, Dark Knight III: The Master Race #4, DC Comics, DKIII, event comics, Frank Miller, Klaus Janson, Krypton, Lara The Supergirl, Ray Palmer, single issue reviews, Superman, The Atom, The CW, The Dark Knight Strikes Again, The Flash, The Flash (TV Series) on 04/28/2016 by primaryignition. PENCILLERS: Jonathan Case. Cover by Ryan Sook. 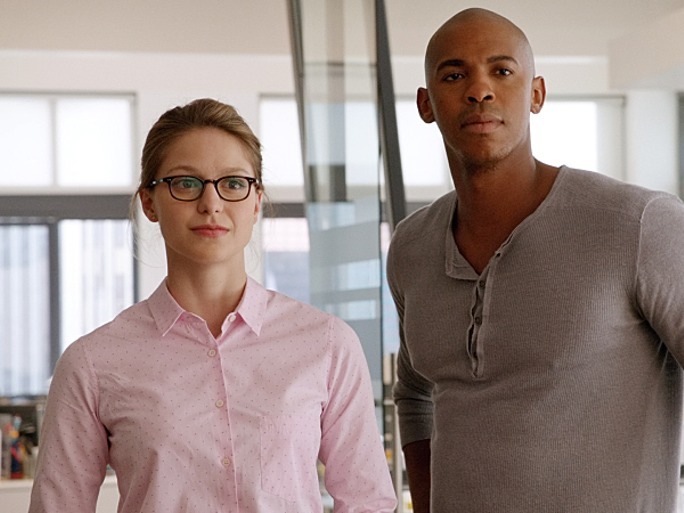 Pete Ross and Kenny Bravermen, two of Clark’s buddies from Smallville, have come to visit him in Metropolis. Understandably, the city has one thing on its mind: Superman. It has at least that much in common with Pete and Kenny. But Clark’s friends have a different perspective on the Man of Steel than anyone in the city. 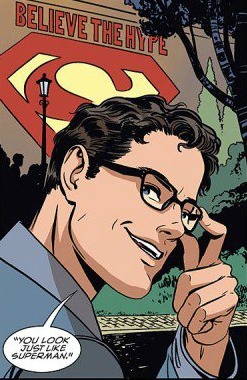 So what do those who know Clark Kent think about his newfound fame? I understand not everyone feels the way I do. But as a fan of both Superman and Batman, I find this offensive. I won’t re-tread ground here. Read the reviews linked above if you’d like my arguments as to why this is so offensive. But sadly, what started as an annoyance has became a major flaw. What makes it all the more frustrating is that this Batman stuff is stuck in the middle of an otherwise great issue. It gives us what you might expect from a story with two of Clark’s old friends. They look at what he’s become and have reservations, largely because they care about him. And he cares for them too. 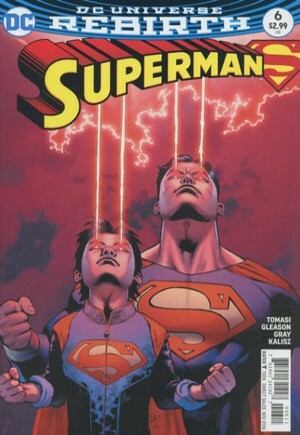 Landis shines a nice spotlight on both the human and alien qualities that make Superman who he is. What’s more, the dialogue between Clark and his friends feels very natural. That’s something Landis has excelled at from the start. Penciller Jonathan Case shines in this issue. His style has a retro feel to it that made him a good fit for Batman ’66. But I’d love to see him take a crack at an ongoing Superman title. His art might not be what we’re used to seeing on Superman or Action Comics, but isn’t that the point? Ryan Sook has been on the covers for this series, and this one is his best yet. What’s so hilarious is that it took me a couple of looks to see Clark Kent in the image. Therein lies the brilliance. 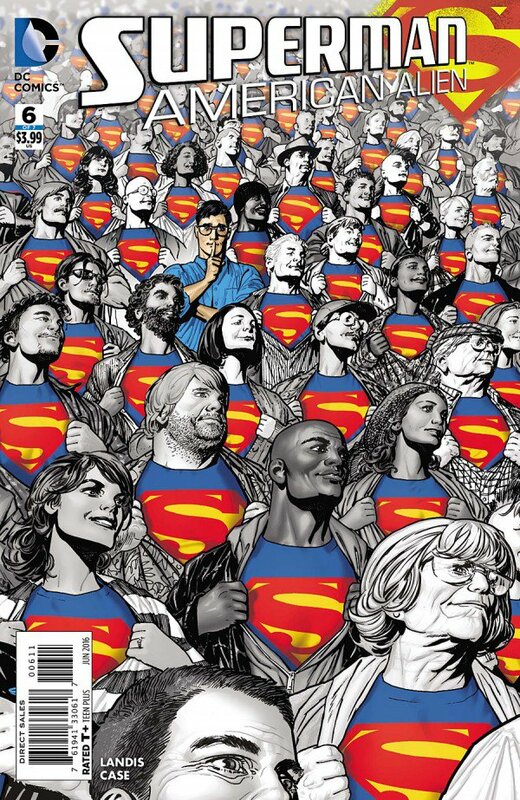 This cover is a visual metaphor for Clark Kent’s existence, and how he’s able to stay hidden. No one is looking for Clark Kent. They’re all looking for Superman. And of course, the image is beautifully drawn as well. 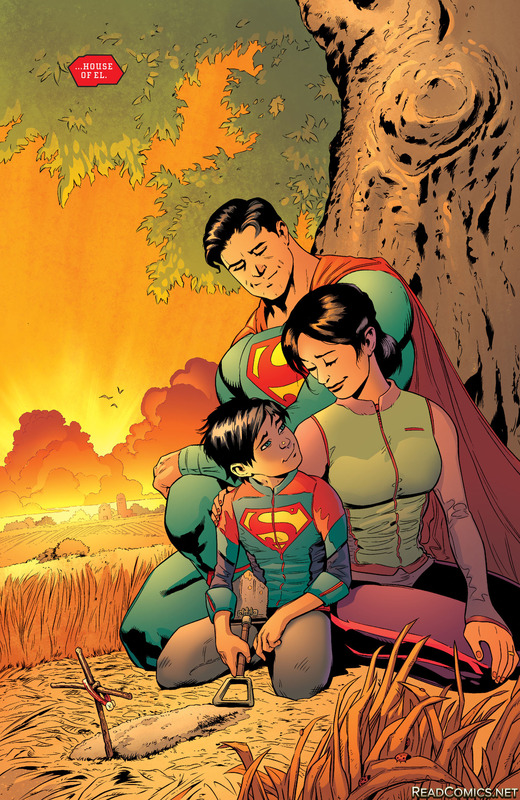 We’ve got one issue left of Superman: American Alien. Based on these last three issues, I’ve got a pretty good idea of what to expect. We’ll get some good dialogue, along with some excellent artwork (Jock is on the pencil next month). We’ll also have a sense that our writer truly cares about the Man of Steel, and understands him in a way previous few writers do. But there’ll also be an infuriating idea in there that drags the whole thing down. 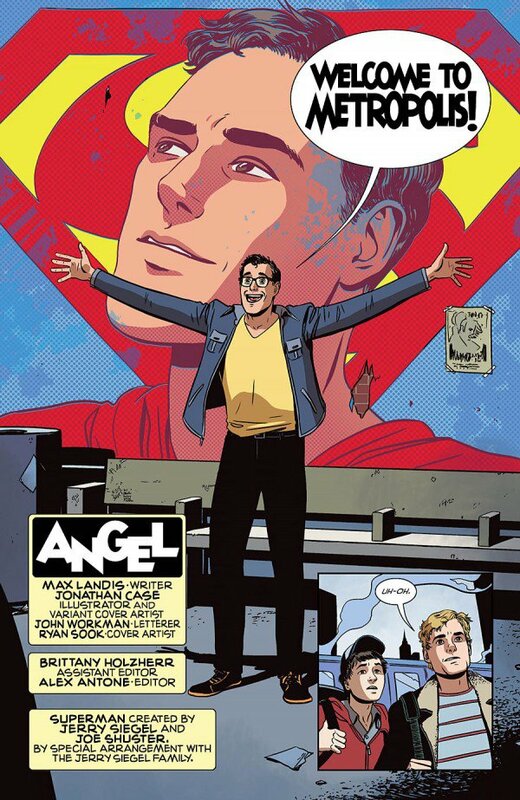 This entry was posted in Comic Books/Graphic Novels and tagged Batman, Clark Kent, comic book reviews, DC Comics, Jonathan Case, Krypton, Max Landis, Metropolis, Pete Ross, Rob Siebert, Ryan Sook, single issue reviews, Superman, Superman comics, Superman: American Alien, Superman: American Alien #6 (2016) on 04/21/2016 by primaryignition.